testified before a House subcommittee Wednesday. WASHINGTON — The president of a slaughterhouse at the heart of the largest meat recall denied under oath on Wednesday, but then grudgingly admitted, that his company had apparently introduced sick cows into the hamburger supply. He then tried to minimize the significance. The executive, Steve Mendell of the Westland/Hallmark Meat Company of Chino, Calif., said, “I was shocked. I was horrified. I was sickened,” by video that showed employees kicking or using electric prods on “downer” cattle that were too sick to walk, jabbing one in the eye with a baton and using forklifts to push animals around. The video was taken by an undercover investigator from the Humane Society of the United States. One tape showed a worker using a garden hose to try to squirt water up the nose of a downed cow, a technique that Representative Bart Stupak, a Michigan Democrat who conducted the hearing where Mr. Mendell testified, referred to as waterboarding. 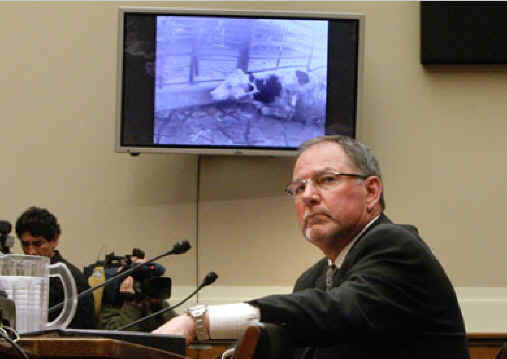 Testifying before the Oversight and Investigations Subcommittee of the House Energy and Commerce Committee, Mr. Mendell, who appeared only after being subpoenaed, assured lawmakers that despite his lack of knowledge about conditions at the plant, sick animals were not slaughtered for food, so no safety issue existed. But Mr. Mendell retracted the statement when shown a second video in which a “downer” cow was shocked and abused by workers trying to move it to the “kill box,” then finally shot with a bolt gun and dragged by a chain to the processing area. Mr. Mendell replied that after he had seen the first video, he concluded that “it was a regulatory violation, for sure, it was inhumane treatment, for sure,” but that he did not believe it was a food safety issue until he saw the second video on Wednesday. Mr. Stupak asked if one could conclude from the video that the cow dragged into the killing area had gone into the food supply. “That would be logical, sir,” Mr. Mendell replied. Mr. Mendell said he had asked for a copy of the second video but it had been refused. The president of the Humane Society, Wayne Pacelle, said, however, that the video had been on the group’s Web site since Feb. 19. Of the 143 million pounds of beef that were recalled, about 50 million pounds went to school lunch programs or federal programs for the poor or elderly, Mr. Stupak said. But the recall covered all the meat produced for two years, Mr. Mendell said, so most of it had already been eaten. The biggest threat from “downer” cattle is mad cow disease. The chairman of the full committee, Representative John D. Dingell, also of Michigan, said the incubation period for the human form could be 20 years. A “downer” animal can still be slaughtered if a government veterinarian has determined the cow is fit for human consumption, but Mr. Mendell acknowledged that no veterinarian was visible on the tape. After the testimony, Mr. Mendell’s lawyer Asa Hutchinson, a former member of Congress from Arkansas and former under secretary of the Department of Homeland Security, said that Mr. Mendell still did not have all the facts about the events shown in the videotapes. Mr. Mendell made the point that parts of the animal most likely to carry the defective protein that causes mad cow were routinely removed. “I think there is less than a minute chance of that product being contaminated,” he said. He also produced audits from outside companies showing that the plant complied with rules on humane treatment of animals, evidence that some committee members said shook their confidence that Mr. Mendell understood the operations of his company. The committee is considering several proposals for new procedures, including food irradiation. That would reduce the risk of contamination by E. coli, the bacterium that killed three children in a 1993 outbreak linked to the Jack in the Box restaurant chain. (Westland/Hallmark was one of the slaughterhouses closed down in that outbreak.) But it would not affect the mad cow risk. A spokeswoman for the Agriculture Department, Amanda Eamich, refused any substantive comment, saying that the case was still under investigation.